U.S. Compliance Standard FMVSS 213. 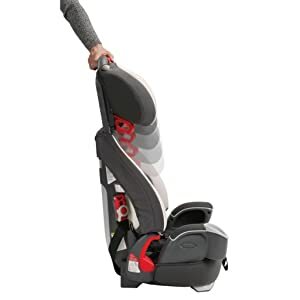 Graco’s top-rated Nautilus three-in-one convertible car seat helps keep your child secure in a 5-point harness, from 20-65 pound and from 27 inch – 52 inch. 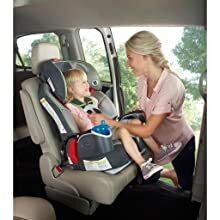 When your child is ready, the forward-facing car seat converts to a belt-positioning booster from 30-100 pound and 38 inch – 57 inch, then to a backless booster seat from 40-100 pound and 40 inch – 57 inch. It’s just like having three car seats, in one. 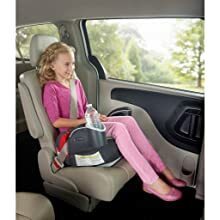 When it comes to attaining a proper fit in your car seat (essential to protecting your child best), it’s important that the headrest and head support are in the right position. The Nautilus features a one-hand height adjustable head rest—a feature experienced moms love. The open loops at the top of the seat easily position your vehicle’s seatbelt, which makes it easier for your independent little (or big) one to self-buckle. Wide, padded armrests are extra-comfy for your child as he / she grows, and this seat has three different recline positions, so it’s simple to get the correct angle for proper installation and optimal comfort. The integrated cup holder and storage (for small games and toys) are added features bigger kids really appreciate.